Benefit Strategies Inc. is a proud Gold Sponsor of the first annual OSP Workin’ It Fashion Show! 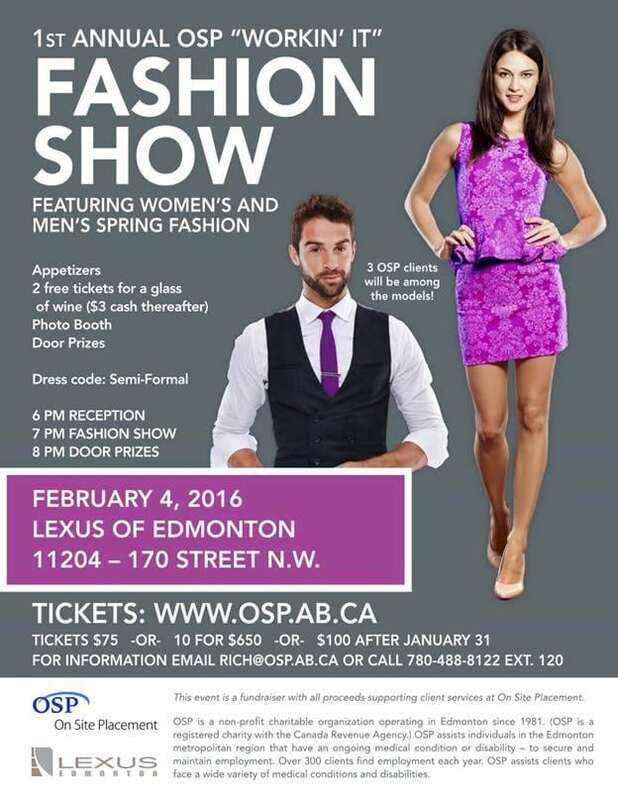 Please invite some friends and join us at OSP’s 1st Annual “Workin’ It” Fashion Show. The show will feature women’s and men’s Spring Fashion. Fun fact: 3 OSP clients will be among the models! Enjoy some delicious food and wine, meet some great people, and get a fun photo in the Photo Booth. Where: Lexus of Edmonton, 11204 – 170 Street NW, Edmonton. When: Thursday, February 4, 2016, 6:00 p.m.
6:00 p.m. – Reception (Wine, Appetizers, Photo Booth). 7:00 p.m. – Fashion Show. 8:00 p.m. – Door Prizes. You will receive a $40.00 charitable donation tax receipt for your ticket purchase. 10 for $650.00. $100.00 each after January 31. Each ticket comes with 2 glasses of complimentary wine ($3 cash per glass thereafter). This event is a fundraiser with all proceeds supporting client services at On Site Placement.